Rescue workers confirmed on Monday that at least 60 people are dead after a dam collapsed in Minas Gerais state in Brazil. Officials say at least 300 other people remain missing. The dam, owned by Brazil's Vale mining company, collapsed Friday in the town of Brumadinho. Water and mud swept over hundreds of mine workers as they were taking a lunch break. Search efforts continued on Monday. Rescue workers used long pieces of wood to cross mud-covered areas to search for bodies inside of a bus. Villagers discovered the bus as they tried to rescue a nearby cow that was stuck in the mud. Ademir Rogerio lives in Brumadinho. He cried as he looked at the mud where Vale’s facilities once stood on the edge of town. Brazil’s top prosecutor, Raquel Dodge, said Vale should be held responsible and criminally prosecuted. She added that executives working there could also be personally held responsible. Reaction to the disaster could threaten the plans of new Brazilian President Jair Bolsonaro. He wants to reduce restrictions on the mining industry, and has proposed opening up indigenous land areas and parts of the Amazon rain forest for mining. Four years ago, another mining dam broke in the state of Minas Gerais. Nineteen people were killed. That dam was controlled by Vale as well as Australian mining company BHP Billiton. The 2015 dam collapse released millions of tons of deadly iron waste along hundreds of kilometers. It caused what is considered Brazil's worst-ever environmental disaster. 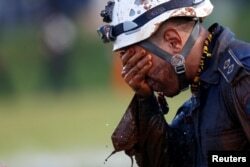 A member of rescue team reacts, upon returning from the mission, after a tailings dam owned by Brazilian mining company Vale SA collapsed, in Brumadinho, Brazil January 27, 2019. Jonathan Evans adapted this story from Reuters and VOA News reports for Learning English. Ashley Thompson was the editor. Are Brazil’s Rainforests in Danger? Bolsonaro Win Could Strengthen Relationship Between Brazil and U.S.